Having little girls means lots of excuses to make adorable girly things. I have been making Isabella hair bows and flower clips for years, and now I have a new baby girl to craft for. Yay! All the cuteness needs a place for storage though, and I never could make myself throw all the bows and clips I spent so much time on in a drawer or box to get squished. That’s when I decided to make my own bow holder. Sure, you could buy one, but where’s the fun in that? 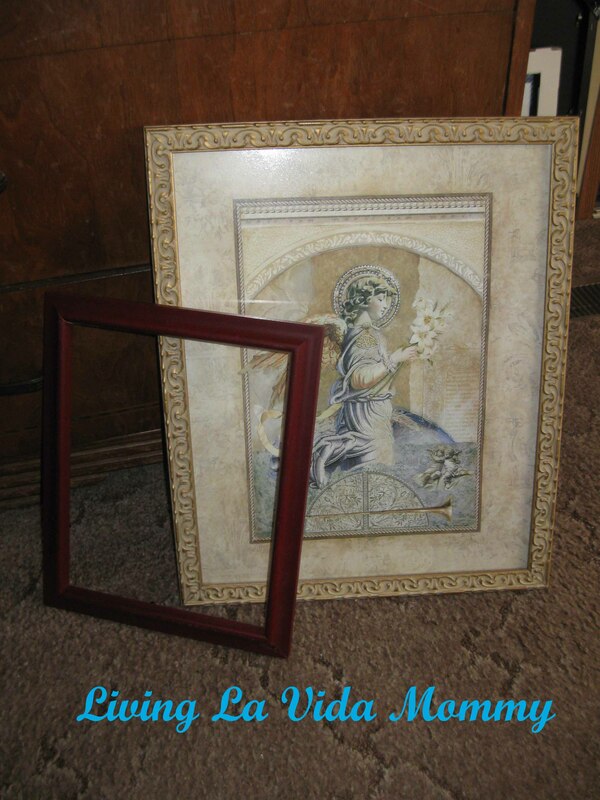 I started with two frames I had laying around without a purpose. The large one there is an old art print I had hanging on my wall at one point. Don’t judge, I was young and didn’t know any better. Anyway, it had an interesting frame that wasn’t being used so I decided it was perfect for this project. The print and glass are pretty easily popped out. Keep that in mind next time you are shopping at thrift shops or garage sales. Try to look past the ugly and imagine what you can do with the frame. 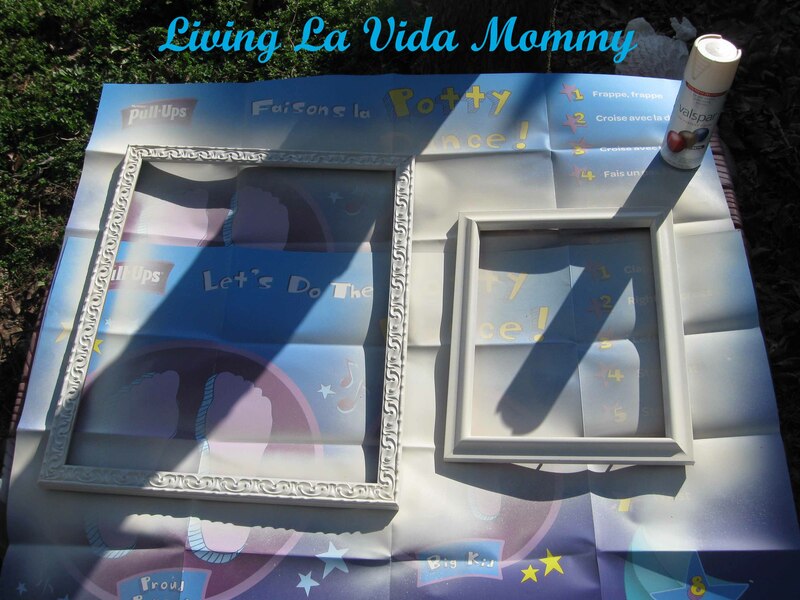 I took the frames outside and gave them a few coats of spray paint on my fancy Potty Dance Mats. Don’t be jealous, its hard work being this awesome. I didn’t sand the frames, just cleaned them really well so the paint would adhere without a problem. Then I waited for these puppies to dry. That was the hardest part for me. I am not a patient person. Here I have my supplies for the next step. 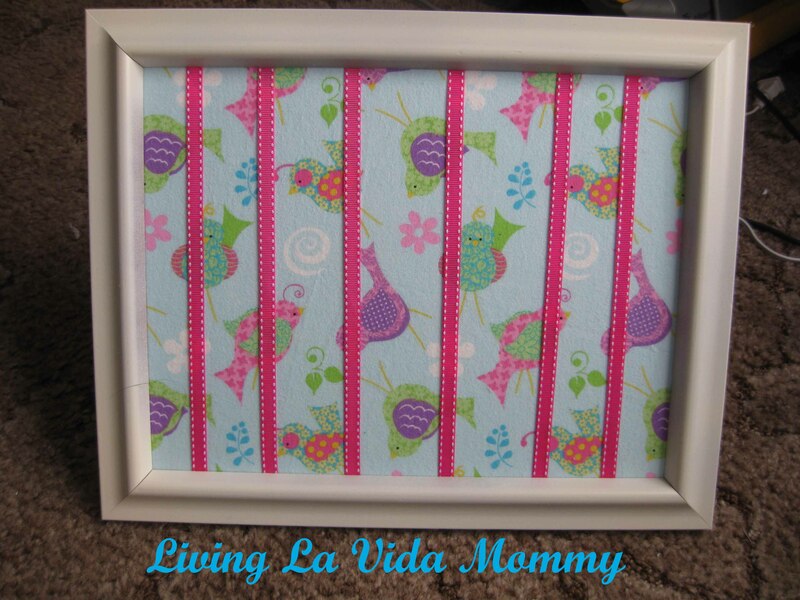 The painted frame, a piece of foam core cut to fit the frame, and pretty fabric. I chose Fancy Nancy because, well, we’re fancy people here in this casa. 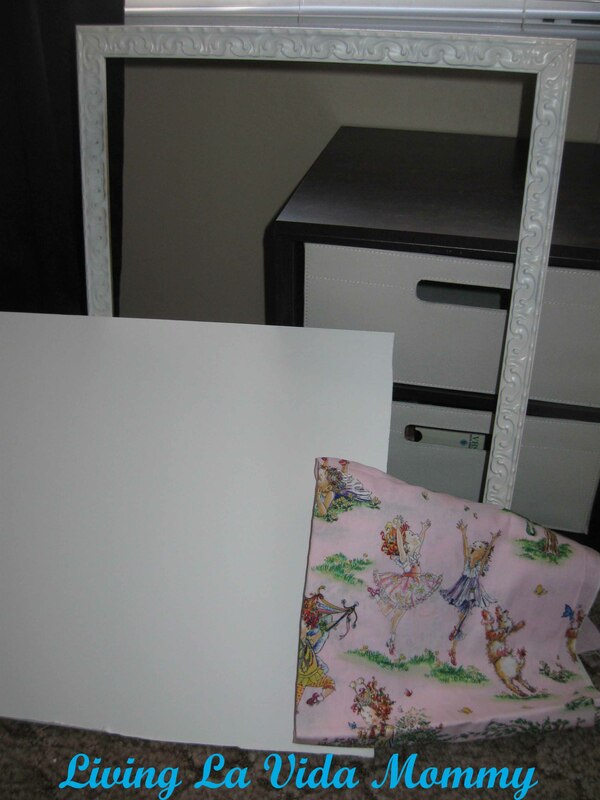 Cover the foam core with your fabric and hot glue it in place. Do you have to use hot glue? No. You could use any heavy glue you have, it would just take longer to dry. Heck, you could use duct tape. You won’t see it and it gets the job done! I used hot glue because, as I have readily admitted, I don’t have a shred of patience in my body. Be sure and pull the fabric tight so its nice and flat. Next comes ribbon. Now, you could get fancy and do the diamond pattern like you see on the store bought message boards. I didn’t do that here because I felt like this way would hold more clips and bows. Also, this was easier. 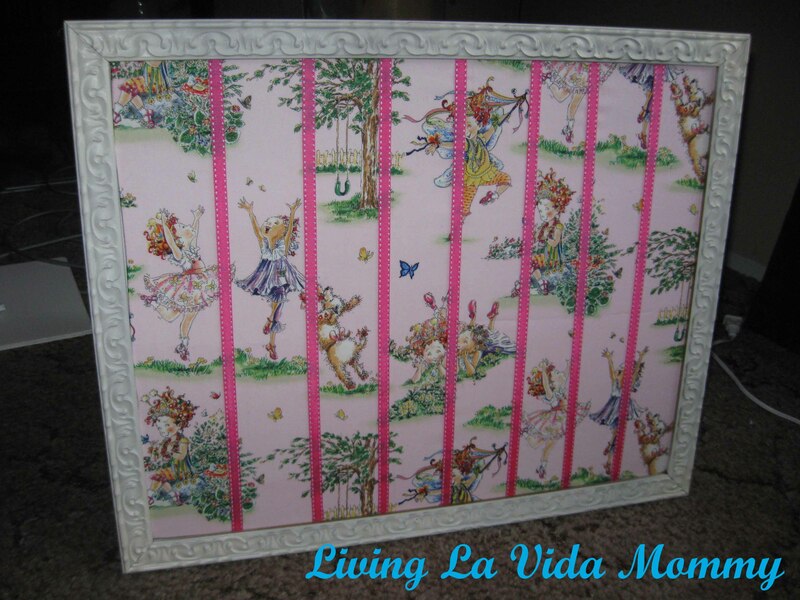 Just measure the ribbon so that you have enough excess on the back to glue it down securely. I think using several different types and colors of ribbons would be cute too. The last step is just to plop it back into the frame. Pretty easy, right? And I think it is super cute. Fancy Bella agrees with me. 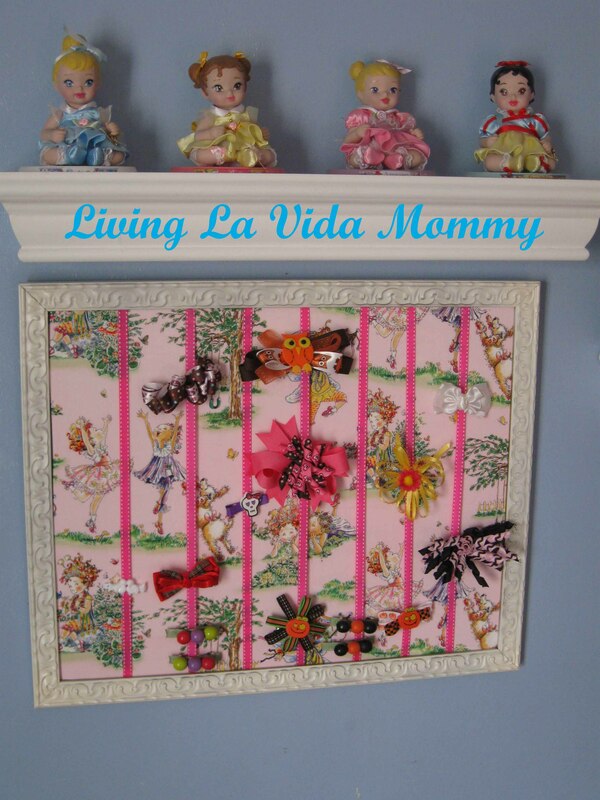 Here it is on the wall with just a tiny fraction of the bows, to give you an idea of how it works. Easy peasy. And of course, here it Little Bit’s bow holder. Hers is smaller, but its all the same steps. 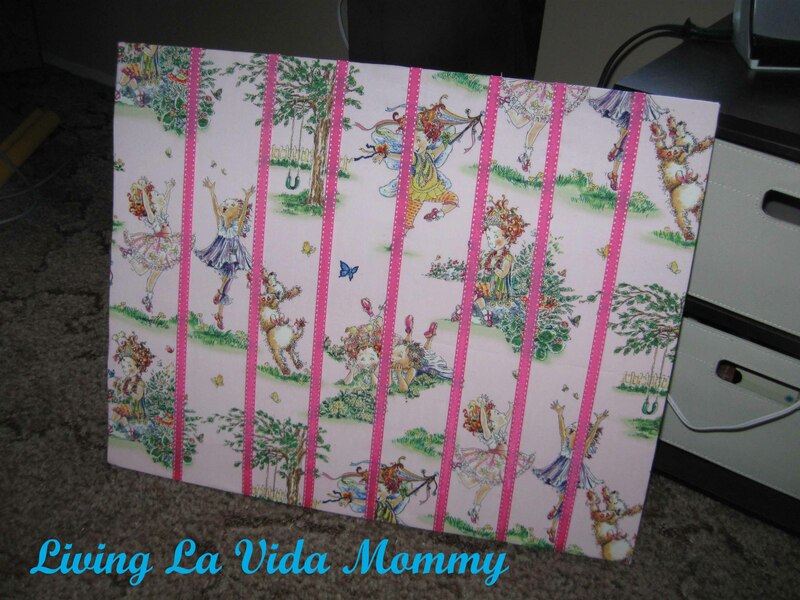 Do you recognize that fabric from the DIY Earring Holder? I told you I loved this fabric. So cute! I can’t say I used to watch Green Acres, but the theme song certainly plays in my head as we are getting closer and closer to buying our house. We will have our current home paid off early next year, so by this time 2013 I should be griping about packing or unpacking boxes. Oh yes, there will be griping. But it will be with a smile. The last few years we have been growing more and more of our own fruits and veggies. My dream house will have ample land to venture out even further into our home garden. I dream of fruit trees and rows and rows of homegrown goodies. I also want chickens. Yes. Chickens. Just a small flock, probably a fancy mix of about 6-10 hens. They will be free range, they will be beloved pets, and they will give us yummy, fresh, organic eggs. Don’t you wish you were my future neighbor? In all honesty, I know what you’re thinking. You hear the word chicken and you are thinking of dirty, gross, noisy birds. You know what? That’s not true. They are loving, nice little creatures that flourish when properly taken care of. Roosters are noisy. Yes. I won’t have any roosters. At least not until we live on an actual farm, which probably won’t ever happen. But a small flock of hens probably wouldn’t even be noticed by the neighbors, except for when I am bringing them free fresh eggs. Hard to complain about that. Add in some fresh tomatoes, pickles, apple butter, you name it and you really are wishing you were my future neighbor now, aren’t you? Backyard chickens are actually gaining popularity right now. And we’ll have the benefit of checking city ordinances before we even purchase our new house, so ideally, that won’t ever even be a problem. Plus, the benefits of having free range chickens are overwhelming, not to mention that the eggs are even healthier for you. Okay, jumping off the soapbox now. You know whats awesome though? I tell Abe all my kooky ideas, like wanting to have chickens when we move, and he doesn’t even blink an eye. I guess after 17 years of being together, he’s gotten immune to the crazy. Its a good thing, as Martha would say. Since news of my Mom’s cancer diagnosis, I have been a mess. Not on the outside so much. 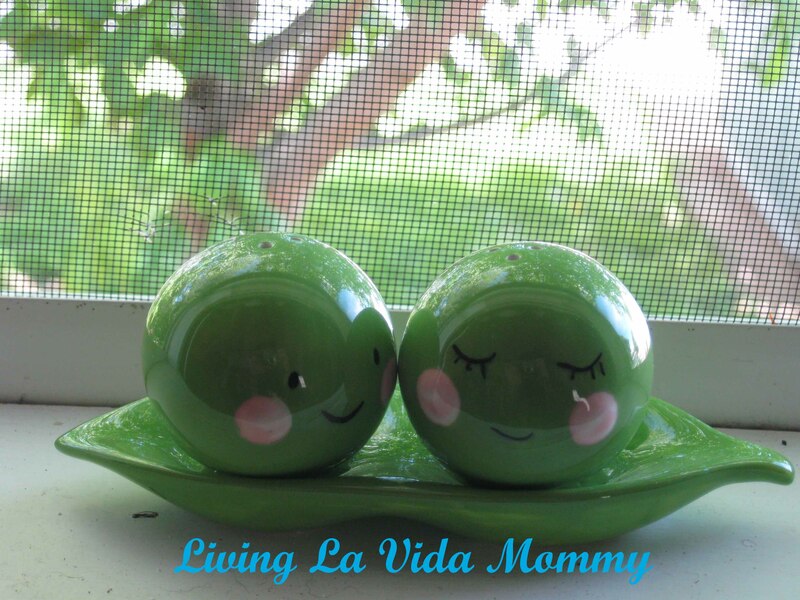 I have had a few breakdowns while the kids were at school and the babies were napping. I have every emotion under the sun fighting inside my head. Her surgery has been rescheduled for Monday, and they will be removing the entire thyroid. I know she will be in the hospital at least overnight, possibly longer. I want to be optimistic, its my nature. No sense in worrying, always look on the bright side, glass half full, yada yada yada. But this is my mom, so the tiny voice of doubt is much bigger and stronger. Between the worrying, Mother Nature has been bringing me several smiles. Yesterday morning, there were so many butterflies flying around me and the kids as we went to the bus stop we couldn’t help but giggle with delight. They seemed to come from nowhere and they kept landing on and around us, staying around much longer than usual for us to admire their beauty. Our seeds we planted just a few short days ago are very quickly sprouting. That big, tall over achiever there is a cucumber plant. I am really looking forward to canning some home made pickles later this season! 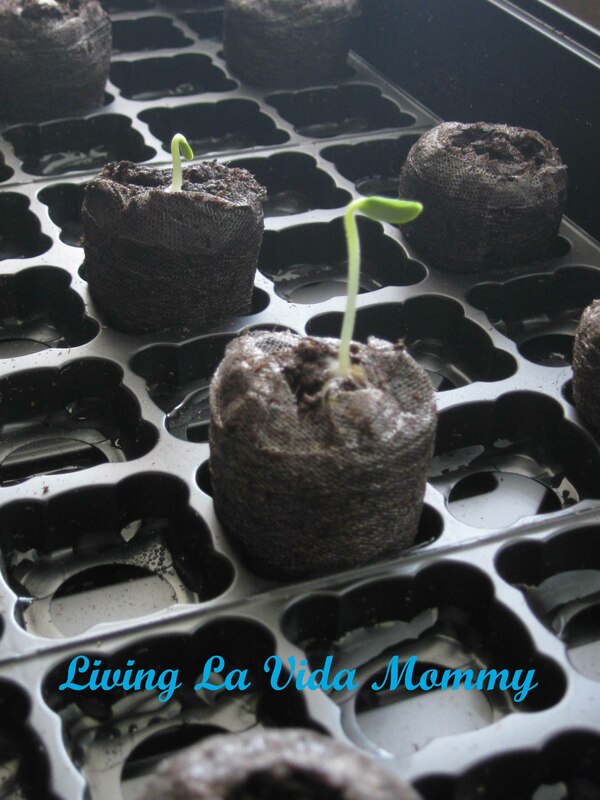 Our pumpkins and butternut squash are also sprouting and will all need to be transplanted soon. 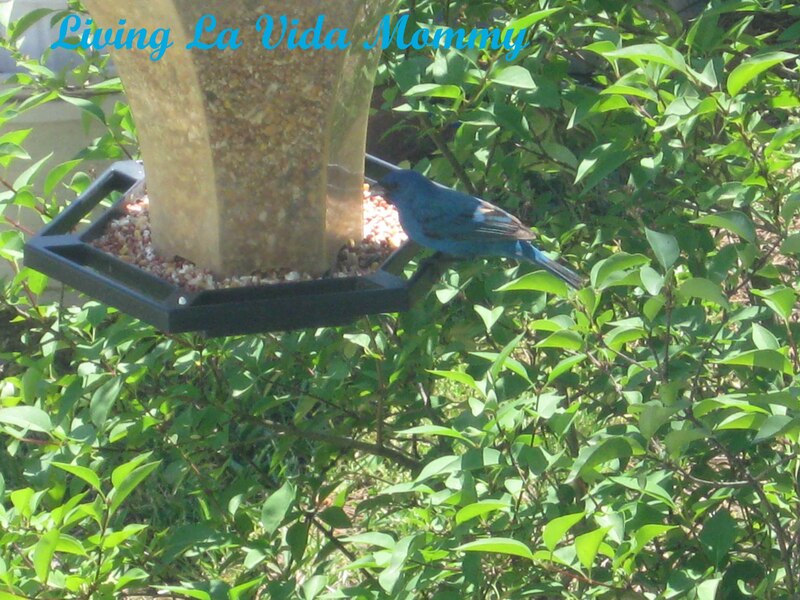 This gorgeous little guy is an Indigo Bunting. He came to the bird feeder after an especially bad break down yesterday, and graciously lingered long enough for me to snap a few pictures of him. What a beauty! I am finding joy when and where I can. Bella has her last dance competition of the season this weekend. She is so excited, I can’t wait to see her on stage again. We have birthday parties and recitals and so many things to look forward to in the coming weeks. Maybe even a wedding! I predict that this weekend will be rough. Monday will be torturous. But once the surgery is over, once my mom is home safe and sound, recovering and healing, I will be able to once again take a deep breath and all will be well. Thank you for the thoughts, prayers and well wishes. Excuse me for being a recluse. I am very appreciative. Big girls do cry, and that’s okay. I am an emotional person. I wear my heart on my sleeve and it is easily bruised. I love with all of my heart, and sometimes that is a flaw. I love to the point of anxiety. I worry for my loved ones health and safety. I am a complete mess at funerals. Sappy commercials make me cry. Uncontrollable ugly crying is not cute. I know that. I hate that I cry easily. I hate that I am so thin skinned. But that is who I am. I am 32 years old. I am capable of hearing “bad news”. I don’t want to hear bad news, but I am capable of hearing it and responding without doing something dramatic. Will I be upset? Of course! Does that mean I shouldn’t be told? No. Just no. Abe came home from work, as he likes to do, and told me that my parents are planning on stopping by. That tiny statement immediately threw up several red flags. First of all, my Dad does not come by to casually visit. Ever. He is a homebody like his padre was. He only leaves the house if it’s completely necessary. Secondly, it was bizarre that they would call Abe at work to tell him this, and not me. My Mom had surgery scheduled to remove her parathyroid gland. She has a morbid tradition of coming to see us all “one last time” before any of her surgeries. (She has had more than I care to mention, ay yi yi!) At first, that’s what I thought the purpose of the visit was, but it just seemed….off. When I probed Abe for answers, he reluctantly told me that my mom wanted to come by and tell me her news in person. At this point, I will admit, I was mad. I felt betrayed and angry that they had this secret conversation behind my back, as if I were a child that needed to be told gently. It’s insulting. It’s been done before, and I was just as angry then. At this point, I was crying and yelling at him to spit it out, tell me what they were keeping from me. Begrudgingly he told me. I locked myself in my bedroom and cried, in shock, in anger, in disbelief. Then I called my mom. I sucked up all my tears, I hid my shaky voice and I told her that I knew. I told her not to hide things from me, I can handle it. She told me the only thing she was worried about was telling me. That’s embarrassing. My mom is diagnosed with cancer, and the only thing she is worried about is telling me. I talked with her for exactly 24 minutes. Our phone times your calls for some bizarre reason, and every time you hang up, you are greeted with the exact number of minutes and seconds that you just spent chatting. I assured her that I was fine and told her not to worry about me. She’s what matters right now. I brushed it all off and acted calm, I told her that she would be fine. The tears were rolling down my cheeks the whole time, but I kept it together for her. I am capable of doing that, as I have said. Now what? I predict I will spend the rest of the day crying and scaring myself sick by doing internet searches on thyroid cancer. I will worry, I will be scared, I will be a mess. But once I get that out of my system, I will be optimistic. Worrying won’t fix anything. Tears won’t change anything. This is out of my hands. Feed your faith, and your fears will starve to death. Isabella loves going into Claire’s stores and drooling over all the pretty earrings and girly stuff they stock. I have to admit, I love going in there too. The cuteness factor is over the top. The price tags? Well they are over the top too. Especially the tiny, albeit crazy adorable, earring holders. I could not justify spending $20 on the tiny holders, so I decided to make one myself. For free. Did you hear that Abe? Free! Well, because I already had the materials on hand. But still. Free! Its simple, but functional, and I love it. I think the photo explains it all, but I’ll still tell you what I did. 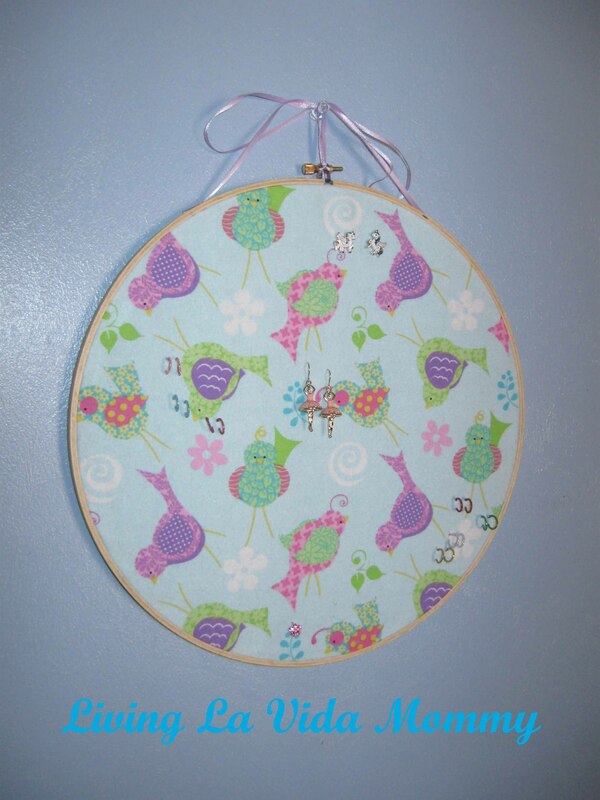 Basically its just a pretty fabric that I loved, stretched in an embroidery hoop. 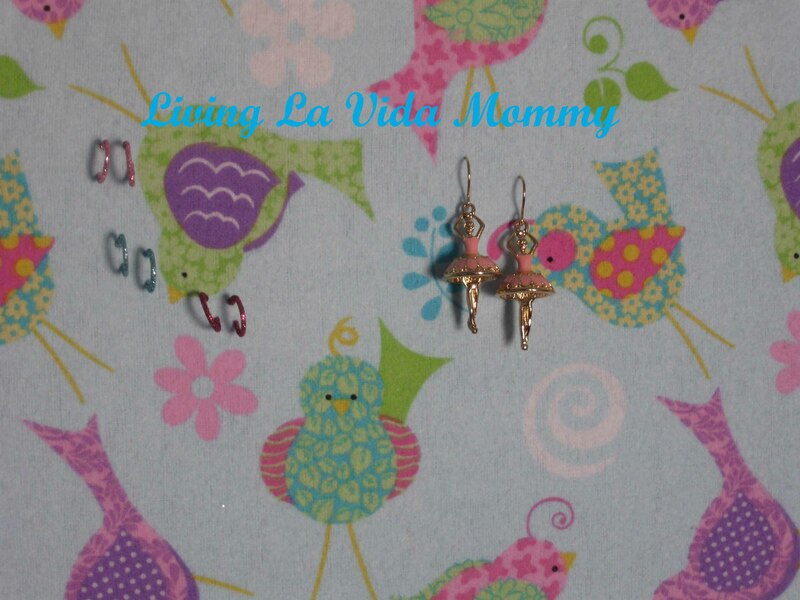 I used a large one, because we have lots of earrings and also because I love the pretty little bird pattern on the fabric. I cut the excess fabric and then hot glued the edges on the reverse side to keep everything in place. I tied a ribbon to the top for hanging, and as for the earrings, well they just stick right through the fabric! Easy as that! I am gentle when I put the earrings in, so as not to over stretch the fabric and make it look loose. I have seen variations with lace and screen, and all kinds of other complicated tricks, but this works just fine. I’m sure you could make it fancy, paint the hoop, add some ruffles or other embellishments, but I kind of like the simplicity of it how it is. Even if I had to buy the materials, the hoop would be less than $2, and the fabric about $3, so we’re talking super cheap here. Cute and cheap and functional. Yup. That equals awesome in my book. This is a picture of the crazy adorable salt and pepper set my cousin gifted me this past Christmas. Que linda! I love it. I can not look at it without smiling. I have it placed in my windowsill above my kitchen sink, where I get to peek at it several times a day. Perhaps one day I shall use it for its intended purpose, but for now, it is simply my daily smile generator. Speaking of splurging on my babies, let’s talk about Citrus Lane. I discovered this company through a Facebook sidebar ad. It was advertised as a “monthly care package for moms and babies”. Intrigued, I clicked the link and instantly fell in love with the idea. I love to get mail. Who doesn’t? (That’s my Saraphina in the pictures, by the way. I think this may be her blog debut. Let the “awwws” begin.) I also love surprises, and essentially, the idea of Citrus Lane is to surprise their subscribers with items of the month’s theme. Citrus Lane was founded by a mom. 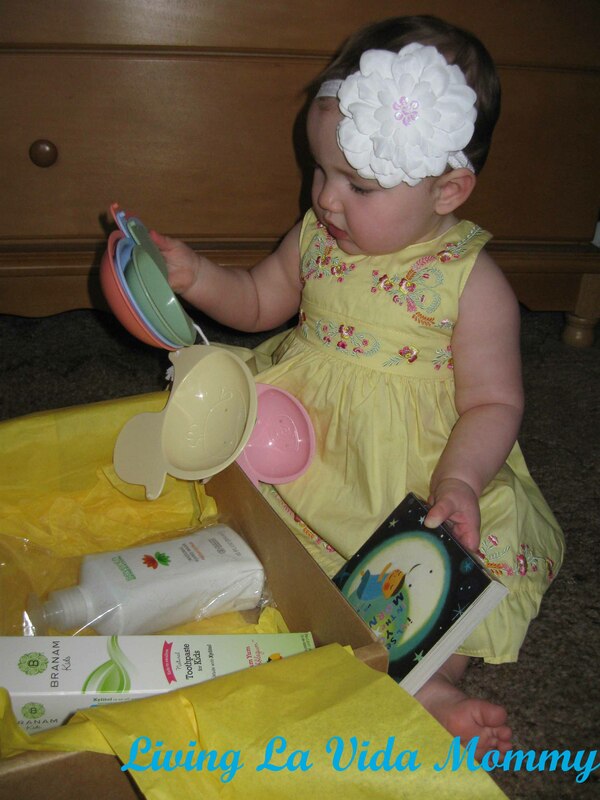 While preparing for her first baby, she researched and asked everyone she knew about which baby products were the very best. The idea behind the company is to provide moms with new and innovative products and companies that they may not have discovered on their own. There is an emphasis on natural and organic products, which I think even the less than crunchy moms (soggy moms unite!) can appreciate. Saraphina thinks the yummy, yellow tissue paper is the best part. This month’s theme is Bed & Bathtime Fun. Each month, you receive 4 – 5 products that coordinate with the monthly theme. 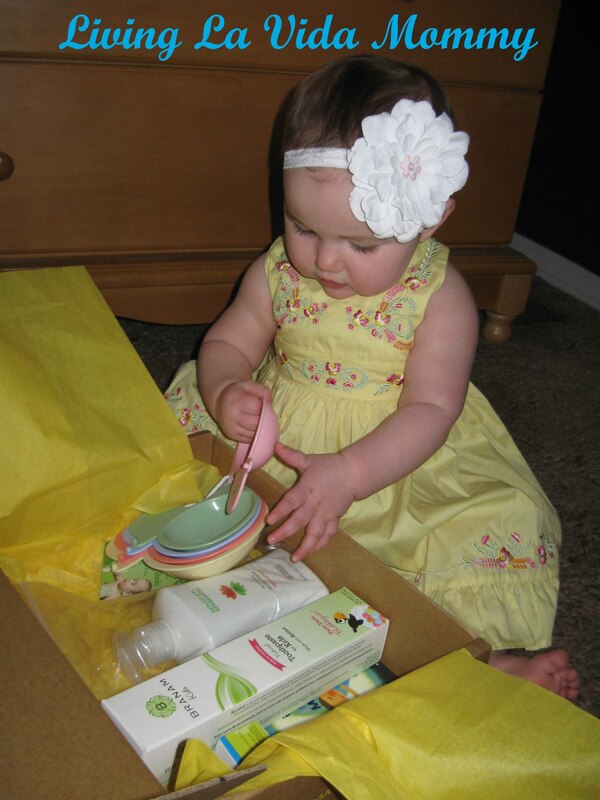 The boxes are specifically chosen for your baby’s developmental age, from newborn to three years old. My box pictured here is for Saraphina, who is 9 months old. As you can see, the ducks caught her eye right away. 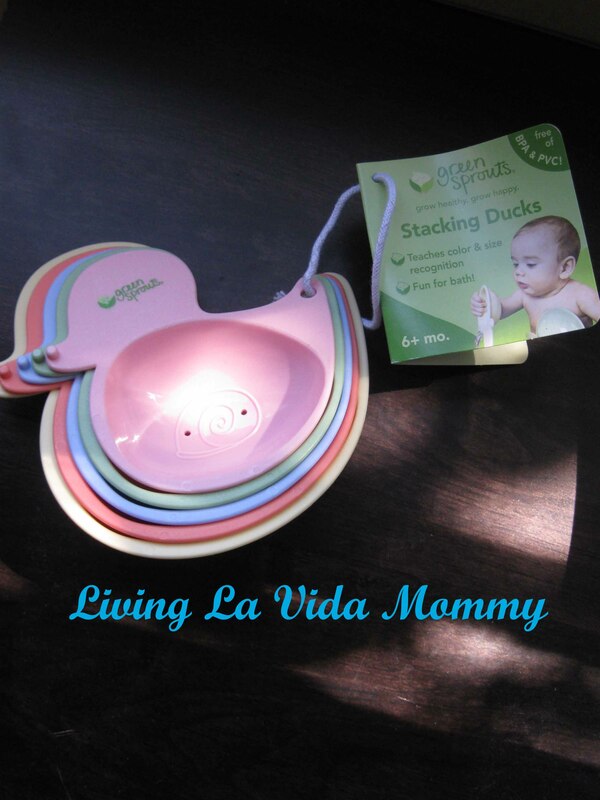 These are the Green Sprouts Stacking Duck Set, BPA and PVC free. How super cute are they? I love the colors and they are fun to chew on. (Sara told me.) These are great for in the tub or out. Citrus Lane includes a price list of their items to give you an idea of the value of their boxes. These are valued by Citrus Lane at $9.99. The delicious looking book is “I’ll See You In The Morning” by Mike Jolly. 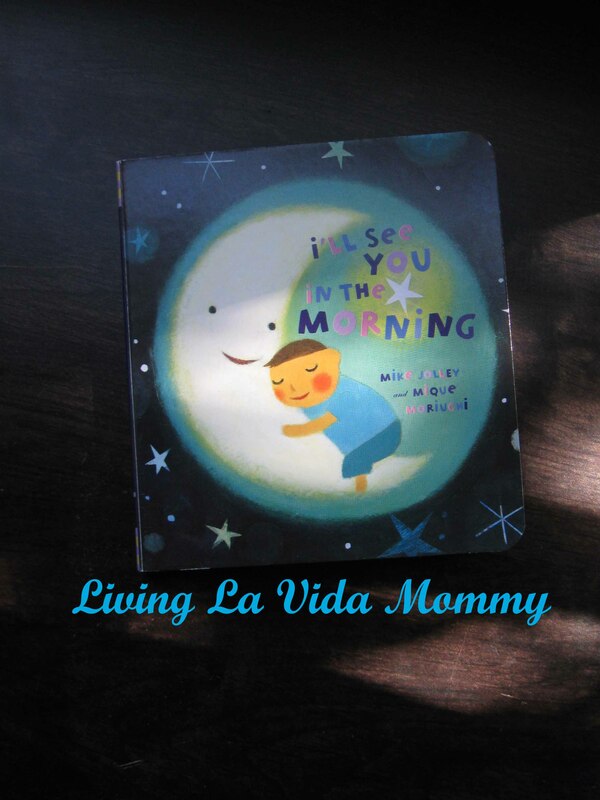 It is a bright and beautiful board book following the bedtime theme. I love the fact that is an actual story to read, not just a word or two per page, like a lot of board books tend to be. We can sit and read this one, letting Sara turn the pages without worrying about a page tearing. Thumbs up from me. Citrus Lane valued this at $6.99. In case you don’t know what SLS is, it stands for Sodium Lauryl Sulfate, which is used in many toothpastes and shampoos, etc for sudsing and emulsifying. It is, as we have come to find out, a nasty chemical that in Bella’s case, does more harm than good. She was constantly getting painful, bloody canker sores in her mouth that left her crying and unable to eat. 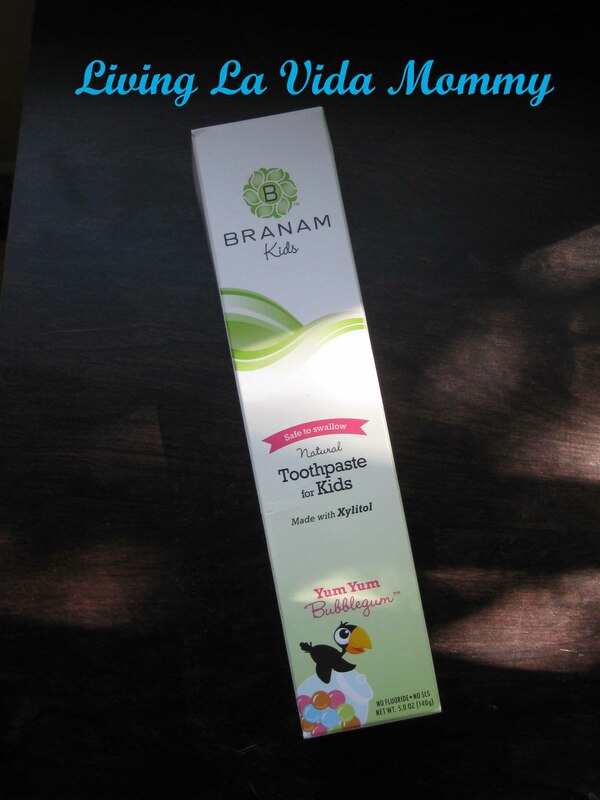 When we asked our dentist about it, he happened to suggest using SLS free toothpaste for her. Since the switch, not a single canker sore has returned! This poor baby was getting them regularly, and it was from her toothpaste! Yes, that was a guilty mama moment. But honestly, we put our trust into companies not to harm us or our children, so how are we to know that they would include nasty, toxic chemicals? Live and learn. 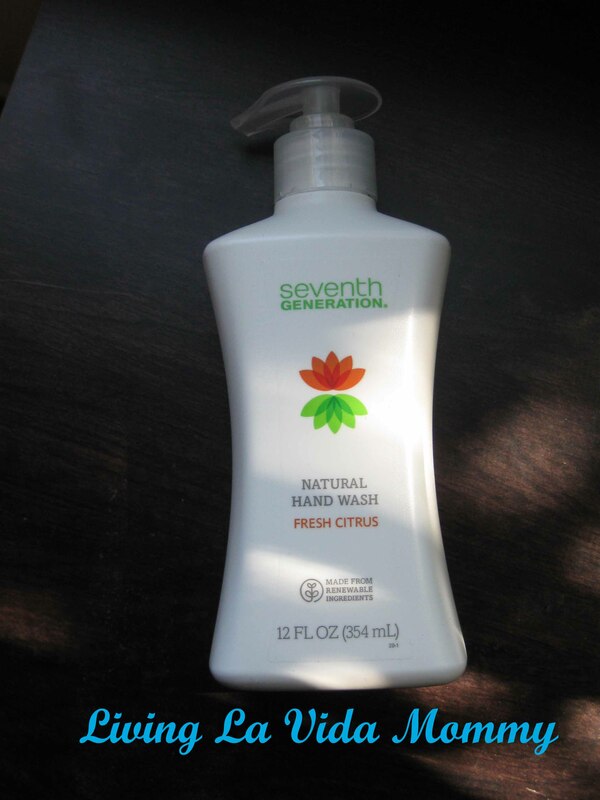 This is a big bottle of hand soap. And it smells wonderful! 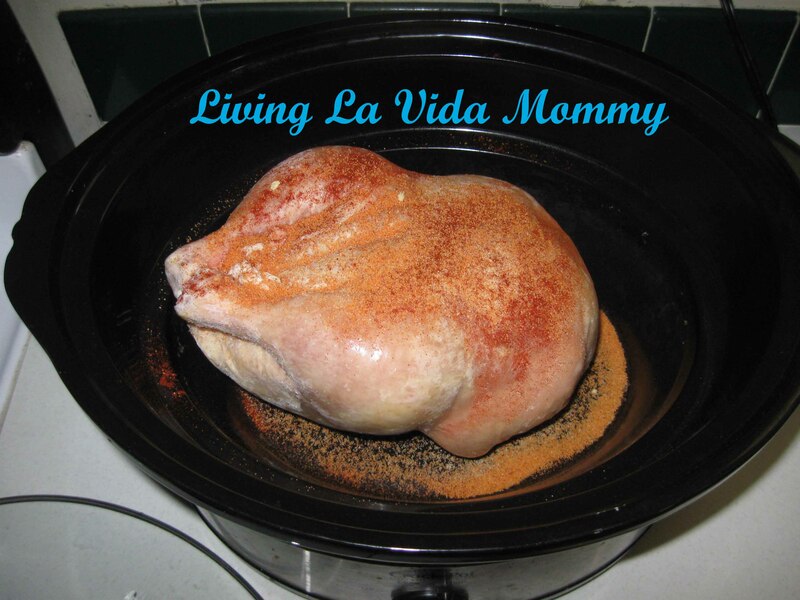 It is fresh and citrusy, I think it just may find a home in Mama’s bano, instead of the kiddos…. Citrus Lane likes to throw in little samples for the mamas, and that is an awesome, much appreciated extra. 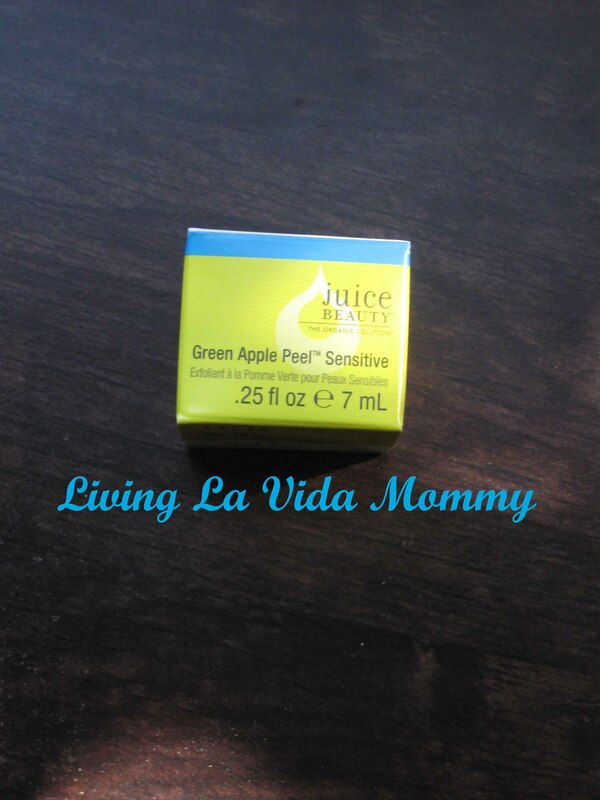 This month’s sample is an organic peel from Juice Beauty. I have not tried it yet, but I have smelled it. Meh. To me, it smells like the rotting apples on the ground when you are visiting the local orchard for your yearly apple picking trip. I’m not ungrateful in any way, and I appreciate it and will definitely be trying it, but the smell is a bit off putting for me personally. Maybe you enjoy smelling like rotten apples, to each his (or her) own. Also included in every box is an insert, giving you details about your goodies, exclusive coupon codes and where to find the items, along with general tips for the month’s theme. This month there was also a $15 gift card for ecomom.com, a discount for chroniclebooks.com, and a special offer from Juice Beauty. I feel like Citrus Lane is an awesome deal, I get my money’s worth and then some. This was our second box and I am very pleased. When I signed up, I subscribed for an entire year, which I felt gave me the very best value. Each box is $25 with free shipping. When I signed up for 12 months and added a coupon code, I ended up only spending about $16 per box. This month, that was practically the value of the gift card alone! 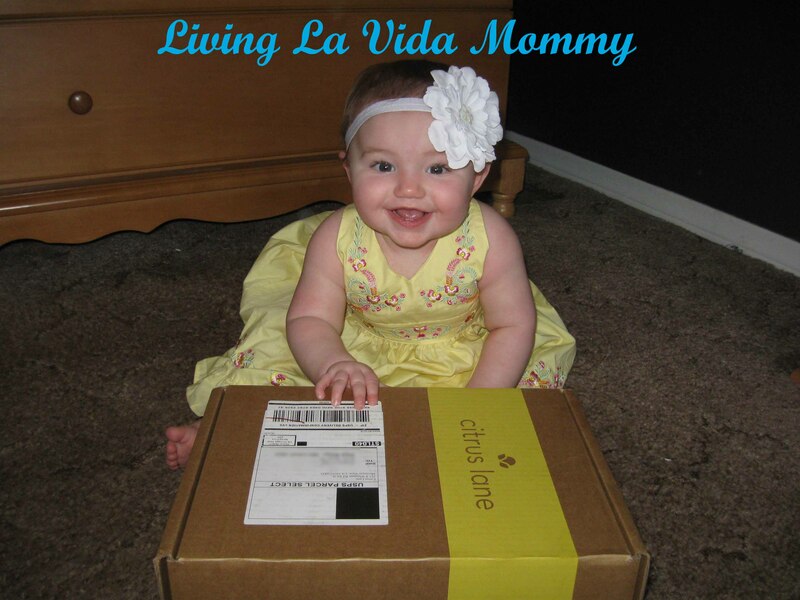 I love discovering the new brands, I love the surprise package in the mail each month, and I love the products. 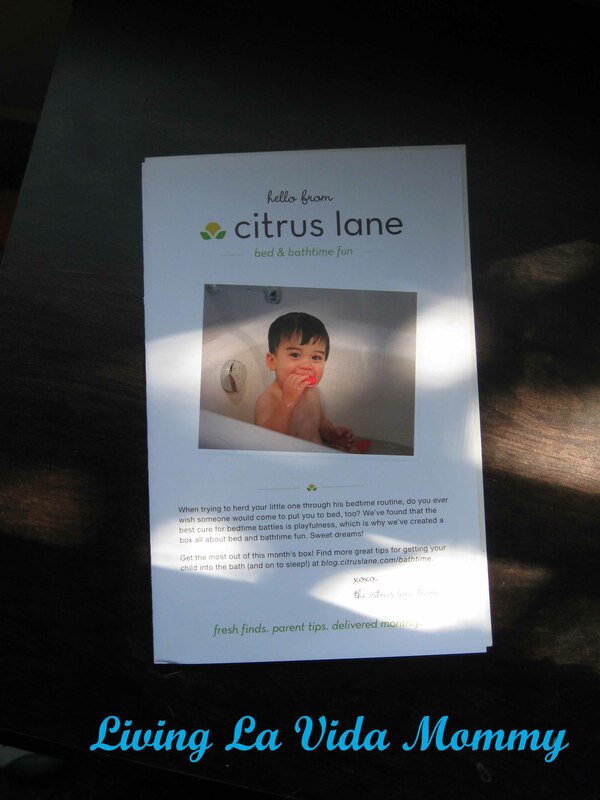 If you want to give Citrus Lane a try yourself, go HERE and then enter coupon code 20TODAY. That will save you $15 on a 3 month subscription, $25 on a 6 month subscription, or $50 on a 12 month subscription. When you subscribe for a full year, they also give you two months free. Oh yes, Mama loves a deal. And $16 a month is far less damage than I could do on a “quick” trip to Target. 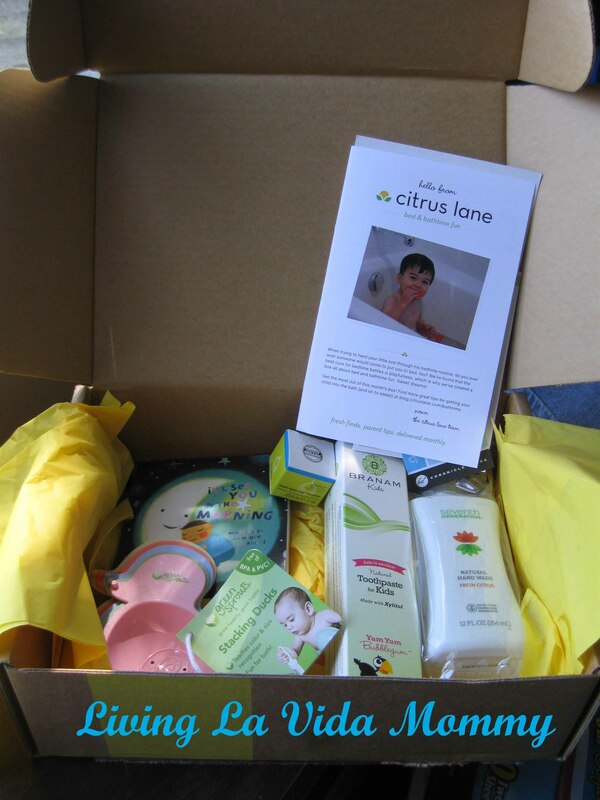 Citrus Lane has not paid me or asked me to write this review, nor have they provided me with any boxes or products. (But hey, Citrus Lane, if you wanna, I am game! ) I just think this service is awesome and wanted to share. I’m cool like that. This past weekend, I had a wonderful evening of good company with a very good friend of mine. We got in some retail therapy, which is always good for what ails ya. Well, it works wonders on me, anyway. As we were looking around the store, we came across the handbags. I love handbags. So does my friend. She told me the two things she likes to splurge on for herself most often are handbags and shoes. Then she asked me what my splurge for myself was. I didn’t have an answer at first, I was racking my brain trying to figure out just what it is that I splurge on. I looked down at my cart that was filled with things for my babies. Clothes, shoes, hair doo dads. My splurge is my babies. 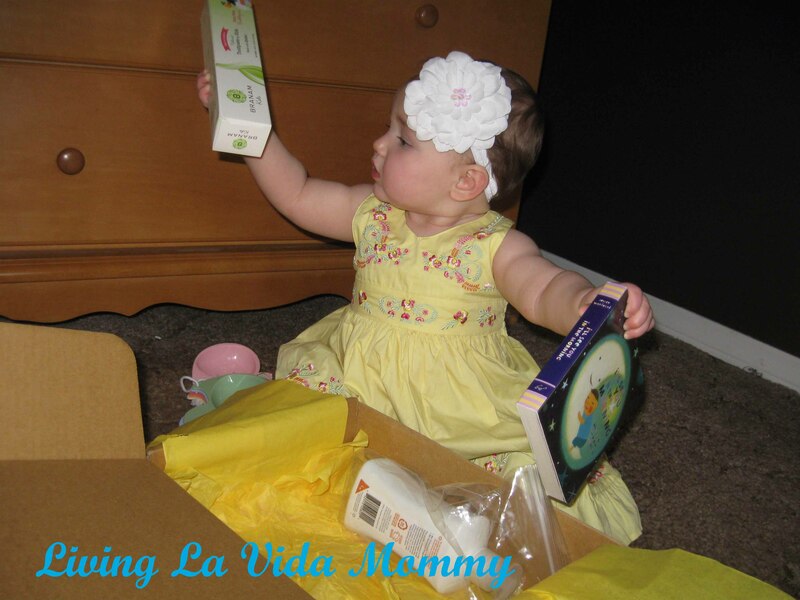 As mommies, how many times do we do without just to give our children more? I think its just natural. I wouldn’t say I never get anything for myself, but really, I get most excited when I am able to get something new for the kiddos. My friend forced me to buy myself a new handbag for myself. Yes, I blame her. It was an awesome deal, and I really did need to replace the one I had. I felt guilty about buying it. How silly is that? When I came home, I told Abe that I bought myself a handbag as if I were admitting to a crime. “Should I return it?” I asked. Of course he said “no”, and he told me to quit feeling guilty. What’s your splurge? Have you treated yourself lately? You should. And don’t feel guilty about it. Everyone deserves a little treat from time to time. And if it helps, blame it on a friend. We should all be so lucky to have a friend that reminds us that we are worth a little indulgence every once in awhile.